Our understanding of how the body produces energy has changed vastly over time as new concepts and theories are unveiled, particularly in the last twenty-five years. We now recognise that the three metabolic energy systems do not work independently. Instead, we can think of all the energy systems being active during exercise, to a greater or lesser extent, all of the time. The relative contribution of each energy system to a particular physical activity will depend on the energy requirements, which will be directly related to the intensity and duration of the exercise. The background science to the concepts of 'Lactate Dynamics Training' and the 'New Interval Training' obviously involves the lactate system and how it functions. We will look closely at this lactate system, which we now understand works synergistically with the aerobic system and permits activity at greater intensity and duration than would be supported solely by the former concepts of 'aerobic processes'. We now know that the lactate system works all the time and is active in the presence of oxygen even though it does not require oxygen. In the past the lactate system was referred to as one of the 'anaerobic energy systems' and this led many people to the mistaken belief that it only operated when there was insufficient oxygen available. The following diagram illustrates the current view of how the three metabolic energy systems contribute over time, if the body is operating maximally for that time period. For an illustration of how the three systems function over time at medium and low intensities as well as at high intensity, click on the 'Science' flash link below and view slide 1. Much of what has been written in the past viewed the lactate energy system as being a purely anaerobic phenomenon, with lactic acid being produced and playing the role of a 'toxic by product' or 'waste product'. Until recently, lactic acid was thought by many coaches, physicians, educators and lay people to be responsible for a wide variety of athletic problems, such as fatigue and sore or cramped muscles. Research has done much to change these views over the past two and a half decades and the modern coach and athlete need to develop an understanding of the current concept of lactate energy provision and the implications that this has on metabolic energy production and on training itself. It was originally believed that lactic acid formation only occurred under conditions where a supply of oxygen was unavailable. This concept of purely anaerobic energy production derived from early research studies. One of the pioneer biochemists, Louis Pasteur, studied the metabolism of simple, single celled, unicellular, organisms and compared the rates of glycolysis when air was present and when it was eliminated. He discovered that when oxygen was absent yeast broke down glucose and produced lactic acid. This is the well known 'Pasteur Effect' (Brooks GA, 1990). Another old theory about lactic acid being the thing that stopped muscles from working was based on an experiment performed in countless Biology classes on dissected frog legs. After being subjected to electric shock the frog legs contracted a few times and then stopped contracting. On examination the motionless frog legs were found to be saturated with lactic acid and consequently this 'proved' that lactic acid was bad, since it was thought to have stopped the muscles from working. Later, in 1923, a researcher by the name of A.V. Hill noted that when exercise intensity increased, lactate concentration in the blood rose slowly at first but at higher work levels, blood lactate rose rapidly. From this, he proposed that at low work rates oxygen delivery to the muscle by the blood was adequate. At higher work rates oxygen delivery was inadequate to meet the metabolic demand by the muscles and so anaerobic metabolism, with conversion of glycogen to lactic acid, came into operation to supplement energy supply. From this came the idea that the 'anaerobic lactic acid energy system' was switched on when the body ran out of oxygen. We now know that lactic acid, as such, just does not exist in the body. As soon as it is formed it dissociates into a 'lactate bit' and an 'acidic bit' that are created in a one-to-one relationship. The lactate bit is definitely not a 'bad guy' but is instead a positive and central player in our metabolism and in how we produce energy. In the past twenty-five years, research has been carried out specifically focussed on determining the metabolic role of lactate. This has been possible by injecting animals and willing research subjects with lactate that has been 'tagged' isotopically. Study of the dilution of the 'tagged' lactate has revealed that lactate production occurs within skeletal muscle during rest as well as during exercise (Brooks GA 1986). Lactate is not a metabolic dead-end and its formation does not mean that all the potential energy stored within the carbohydrate has been wasted. There are several possible fates for lactate, once formed, which result in utilisation, removal and clearing it from the body. 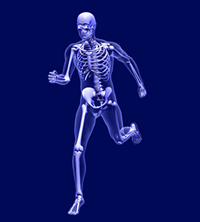 The lactate system is operating all of the time and not just when the body "runs out of oxygen". Lactate is, therefore, being produced in the body all of the time, at rest as well as during exercise. Lactate produced within a muscle cell may be 'consumed' within that muscle cell. Perhaps a better word than consumed would be either metabolised back to pyruvate and moving, or moving as lactate, to the mitochondria and then oxidised within the mitochondria for the production of ATP. Lactate produced within a muscle cell may, additionally, leave that cell to be taken in and used in oxidative metabolism by other muscle cells within the same muscle. Oxidation of lactate is one of our most important energy sources. In highly oxidative muscle fibres, lactate is the preferred fuel source (Brooks GA, 1988). The relationship between pyruvate and lactate is a reversible one and not the 'dead-end' that used to be proposed for lactate produced by anaerobic glycolysis, click on the 'Science' flash link to the side and view slide 2.
be taken up by the brain and used for oxidative energy production. The dynamic action of lactate as a metabolite moving about within muscles and the systemic circulation to provide energy is what Dr George Brooks hypothesised in the 1980s, giving it the term 'The Lactate Shuttle'. Click on the 'Science' flash link to the side to view an illustration of the Lactate Shuttle on slide 4. This concept of the lactate shuttle suggests that lactate is possibly the most important metabolic fuel used by muscle. The formation and distribution of fuel in the form of lactate provides a central means by which the formation of energy in the active muscles supply is achieved. Within the muscle cell there is a continual flux with pyruvate going to lactate and lactate going to pyruvate, in an actively reversible relationship. The accepted understanding now is that muscle cells convert glucose to lactate preferentially since this is a rapid process and quickly permits access to energy production. Lactate becomes then an intermediary to help in the metabolism of carbohydrates from the diet. Apart from the speed of the process, lactate helps in this intermediary role by not stimulating insulin production or fat synthesis. The lactate is taken up and used as a fuel by the mitochondria, which are the 'energy factories' in muscle cells. our most important energy sources. In highly oxidative muscle fibres, lactate is the preferred fuel source". One of the challenges to the hypothesis of lactate contributing in some way to aerobic energy production was, "how does the lactate get into the mitochondria?" Research eventually identified special transporter proteins called monocarboxylate transporters, MCTs, that move the lactate into the mitochondria (Brooks GA, 2000). The MCTs constitute a family of proton-linked plasma membrane transporters that have been identified over the past decade and can carry molecules having one carboxylate group (monocarboxylates), such as lactate and pyruvate, across biological membranes. There are at least 14 MCTs that have been identified, although MCT1 and MCT4 seem to be most relevant to lactate and pyruvate transportation within cardiac and skeletal muscle. As stated, the biological membranes that the MCTs can transport across include those around the mitochondria. As a result of this research, Brooks proposed a development of the original Lactate Shuttle hypothesis, "...the "lactate shuttle" hypothesis has been modified to include a new, intracellular component involving cytosolic to mitochondrial exchange." All of these research findings emphasise how aerobic metabolism and lactate metabolism operate synergistically, and side by side in the mitochondria. Once I heard of the discovery of the MCTs there was a moment when I thought about combining 'Lactate Dynamics Training' and the 'New Interval Training' under the banner of 'MCT Training' since these were probably the mediators of improved fuel production from lactate but there are more things at work here than purely MCTs but they do play a pivotal role in the fate of lactate. The 'intracellular lactate shuttle' gained considerable support in 2006, as summarised in a UC Berkley press release: "This experiment is the clincher, proving that lactate is the link between glycolytic (anaerobic) metabolism, which breaks down carbohydrates, and oxidative metabolism, which uses oxygen to break down various fuels," Brooks (Dr G.A. Brooks) said. the protein complex where oxygen is used. Peering at skeletal muscle cells through a microscope, the two scientists saw these proteins sitting together inside the mitochondria, attached to the mitochondrial membrane, proving that the intracellular lactate shuttle is directly connected to the enzymes in the mitochondria that burn lactate with oxygen." The new understanding of the role of lactate in the body makes it easy to understand why certain types of training we have done in the past have worked so well and how we can now apply this knowledge more precisely, including using Lactate Dynamics Training and the New Interval Training to really bring about major improvements in performance. During exercise, an individual's lactate level may be assessed by taking a small sample of blood and measuring the concentration of lactate. In the past, these lactate values have sometimes been incorrectly used to make projections on lactate production. Since lactate has the capacity to be both introduced and removed from the blood, the lactate level which we measure at any one time is actually a measure of accumulation, not production. The concentration of lactate in the blood represents the combined result of all those processes which add lactate to and remove it from the circulation. At rest, blood lactate values are about 1 millimole per litre, mmol/L, of blood and can rise to in excess of 25 mmol/L during and after intense exercise. Blood lactate levels are low and stable in resting individuals because lactate production is balanced by utilisation and removal. The rates of lactate production in skeletal muscle increases as submaximal exercise intensity increases. At the same time, there is a rise in the rate of lactate reconversion to pyruvate within the muscle. This production and removal is in such dynamic equilibrium that lactate does not 'spill' over to the systemic circulation and, consequently, blood lactate levels are relatively unaffected. As exercise intensity increases there is a slow rise in the level of blood lactate. The small rises observed are despite dramatic increases in lactate production within the muscle meaning that other processes are combining together. It has been recorded that lactate production within exercising muscles may rise to five times the resting rate, or more, during exercise and yet give the same value for blood lactate concentration. that of any other metabolite yet studied"
In summary, we can say that during and after the most intense exercise, muscle and blood lactate levels can rise to their highest values. We now understand that this accumulation above resting levels represents the balance of production and removal. It tells us nothing about whether the accumulation is due to an increased rate of production or decreased rate of removal, or both. In the same way, if lactate concentrations in the blood do not rise above resting levels during or immediately following exercise it also infers nothing about lactate production during that activity. It may be that lactate production is many times higher than at rest but that it is matched by its removal resulting in no visible increase. There is a point, in increasing intensity of exercise, where individuals may show a rapid increase in the levels of blood lactate. This turning point is referred to as the Onset of Blood Lactate Accumulation, or OBLA. The OBLA implies that the dynamic equilibrium which can exist between lactate addition to, and removal from, the blood has been upset. It is not clear at this time what processes have been disturbed or may have reached 'critical' levels to cause the OBLA. In the past, this point in the progression of increasing intensity of exercise where blood lactate production increases dramatically was called the anaerobic threshold. The idea that the cell suddenly switches over from aerobic to anaerobic metabolism is simplistic and misleading, since this does not reflect accurately what is taking place in the muscle and the term anaerobic threshold is not now commonly used. Instead, the onset of blood lactate accumulation is referred to as the Lactate Threshold. To develop the lactate shuttle and the lactate energy system optimally, training at fluctuating intensities is necessary. The recovery during this type of training is best when lactate utilisation and clearance is encouraged and this removal from the body is accelerated when lactate is shuttled to areas of high oxidative activity while maintaining either an active running pace as in Fartlek, or an active roll-on running recovery as in New Interval Training. In this active environment, the lactate may optimally revert to pryruvate and in the mitochondria be oxidised in the Krebs cycle and the electron transport chain to produce water and carbon dioxide. Lactate Dynamics Training is New Interval Training"
Research has gone a considerable way to support these statements, although specific research has so far only examined varying intensities of activity and not yet, the effect of the recovery interval. For example, Dubouchaud H, et al in 2000 evaluated the effects of endurance training on the expression of monocarboxylate transporters (MCT) in human vastus lateralis muscle. They compared the amounts of MCT1 and MCT4 in total muscle preparations and sarcolemma-enriched and mitochondria-enriched fractions before and after training. Their results support the conclusions that, "1) endurance training increases expression of MCT1 in muscle because of insertion of MCT1 into both sarcolemmal and mitochondrial membranes, 2) training has variable effects on sarcolemmal MCT4, and 3) both MCT1 and MCT4 participate in the cell-cell lactate shuttle, whereas MCT1 facilitates operation of the intracellular lactate shuttle." I shall leave the final summary to a researcher who can appraise the current situation in a far more informed manner than I possibly could. In 2008, Dr Bruce Gladden of the Department of Kinesiology, Auburn University wrote, "This year, 2008, marks the bicentennial of research into lactate metabolism in muscle. The cell-to-cell lactate shuttle was introduced in 1984 and has been repeatedly supported by studies using a variety of experimental approaches. Because of its large mass and metabolic capacity, skeletal muscle is probably the major component of the lactate shuttle in terms of both production and consumption. Muscles exercising in a steady state are avid consumers of lactate, using most of the lactate as an oxidative fuel. Cardiac muscle is highly oxidative and readily uses lactate as a fuel. Lactate is a major gluconeogenic substrate for the liver; the use of lactate to form glucose increases when blood lactate concentration is elevated. Illustrative of the widespread shuttling of lactate, even the brain takes up lactate when the blood level is increased." He continues, "Recently, an intracellular lactate shuttle has also been proposed. Although disagreements abound, current evidence suggests that lactate is the primary end-product of glycolysis at cellular sites remote from mitochondria. This lactate could subsequently diffuse to areas adjacent to mitochondria. Evidence is against lactate oxidation within the mitochondrial matrix, but a viable hypothesis is that lactate could be converted to pyruvate by a lactate oxidation complex with lactate dehydrogenase located on the outer surface of the inner mitochondrial membrane." (Gladden LB, 2008). Future research may well change our views but for the past twenty-five years there has been a rapidly growing understanding and appreciation of the formation and role of lactate in the body at rest and while exercising. All that has been proposed so far fits into explaining why 'Lactate Dynamics Training' and the 'New Interval Training' methods, that were born through intuition and coach experimentation, work so effectively. Perhaps scientific researchers will come to use the terms 'repetition' and 'interval' specifically and not in the incorrectly interchangeable way they do at present when referring to training. Until they do it is unlikely that the effect and power of the recovery interval will be scientifically identified, tested and appreciated. We now have the empirical results and the background science, which are enough if you're a coach or an athlete. But, research may unlock something further, possibly? Until then, use the concepts from this website to create the most up-to-date training regimes, and depending on how you use them, a potentially holistic combination of intuition, practice and science to benefit performance.